This week, Jane Cook shares the story of her remarkable, epilepsy-defeating, marathon-running dad Bruce. Read on! My dad is 58 years old and in November last year, he announced that he wanted to run the London marathon in 2014. We all thought he was talking rubbish and didn’t really listen, until he came down the stairs to announce that he had been offered a place in the Marathon on behalf of a Children’s disability charity. Suddenly we realised he was actually serious. My dad has lived in Cardiff all of his life. When he was a kid, he was racing homemade go-karts on Roath Court Road with a bunch of other boys his age. Trying to show off to his Grandma, he came shooting down the road at speed when one of the other boys pushed their kart in to his path. The karts collided with such force that my dad flew in to the air, and as he came down, he hit his head on the concrete pavement. Three weeks later, he started having epileptic seizures. For years, my dad tried different medication to control his epilepsy, but nothing worked. He couldn’t get a driving license because he never knew when an attack might come on. Once, he even ended up having an attack and losing control whilst on his bike, and he crashed through the front door of a corner shop on Treharris Street. He managed to roll all the way up to the counter in the midst of a blackout before crashing a heap on the floor. On another occasion, he fell off a train platform in Cornwall and had to be pulled off the tracks. When I was about three years old, my dad became one of the first people in the world to have a groundbreaking type of treatment. First, doctors cut a circular hole in his skull. Then they fixed electrodes to his brain that would monitor its activity (I am using layman’s terms). Then everyone waited. A week later, my dad had another seizure, and as a result, the doctors were able to pinpoint the exact area of his brain that was damaged. They set to work in removing the damaged tissue, which amounted to be the size of a human fist. Afterwards, they replaced the piece of skull, and sewed it all back up. For the next few months and years, it was a waiting game – not only to see whether the operation had been a success, but also to make sure that nothing else had been damaged in the process. Fast forward 25 years, and the date of the London Marathon is just one day off being the 25th anniversary of my dad’s operation – and marks 25 years of my dad being epilepsy-free. Despite the fact that my dad started his marathon training by going for a jog in a pair of jeans and his work shoes, last weekend he (quite unbelievably) completed his first 20-miler. His route takes him all over Cardiff – usually from our house in Penylan, via Lisvane and over to Cefn Onn Country Park, then back home via a couple of laps of Roath Park Lake. The money raised by my dad will be donated to a charity called Phab which encourages equality and integration for disabled and able bodied children. If you would like to help him reach his fundraising target of £1,600, you can donate via his fundraising page. Jane Cook is the proud daughter of Bruce Cook, who will be running his first London Marathon this year. 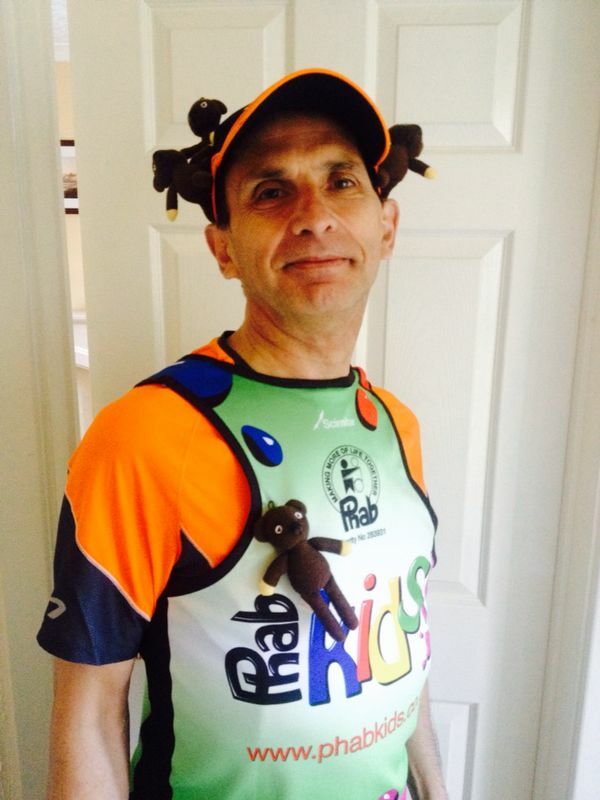 Help him raise money for his chosen charity Phab by donating to his fundraising page. The family currently live in Penylan. ← We Are Cardiff – neighbourhood survey 2014!